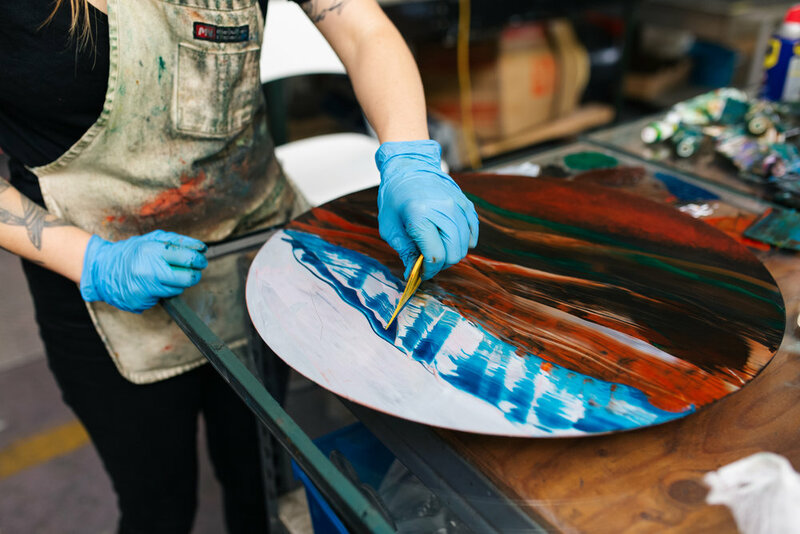 Anna Wingfield is a printmaker creating original abstract prints inspired by the textures and colors found in oxidized metals and the natural world. By fusing traditional forms of monotype/print, intaglio, and ink-wipe techniques, she captures brief moments in time that are familiar, suggestive, and timeless. The circular copperplates are left untouched from the intaglio processes and continue to decay from the natural oxidation of the copper and printmaking process. Manipulating the interactions between the ink and copper surface, Anna interprets forms seen consciously and subconsciously in her natural surroundings. The technique of ink-wiping allows her to curate textures, perspectives, and sensation while simultaneously allowing each viewer to individually experience their own brief moment. The circular format of the print is meant to highlight and capture the more personal experience of the memory. Anna works out the Arts District of Los Angeles, California. She received her BFA from Goucher College and studied fine art at Goldsmiths University in London and The Students Arts League in New York City.